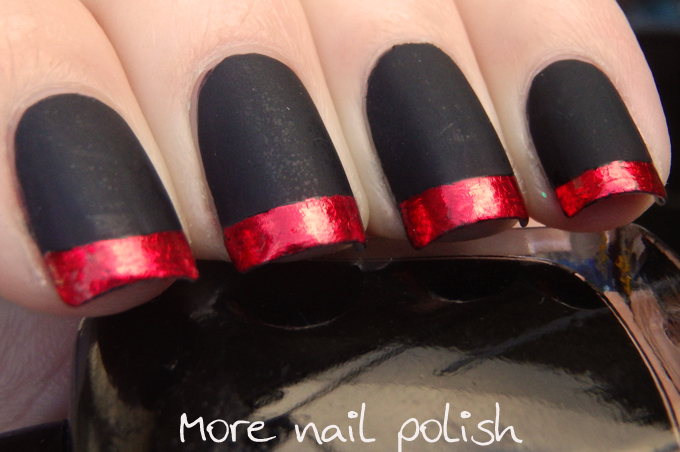 Matte Black with red foil tips, inspired by ModCloth dresses. I recently received an email from ModCloth, asking if would be interested in being part of their Nail Klub and Dresses challenge. The idea is to check out their massive range of dresses, pick one and interpret it in nail art. I'm always looking for nail art inspiration, and let me tell you, browsing through their range of dresses has given me so many mani ideas. I've already bookmarked 10 different dresses that I plan to interpret into nail art. Here's the first one that grabbed my attention. 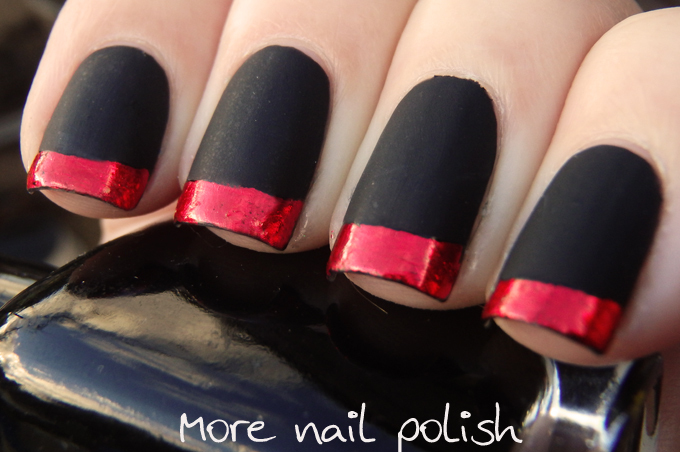 This simple black dress with a red band around the hem gave me immediate nailspiration. 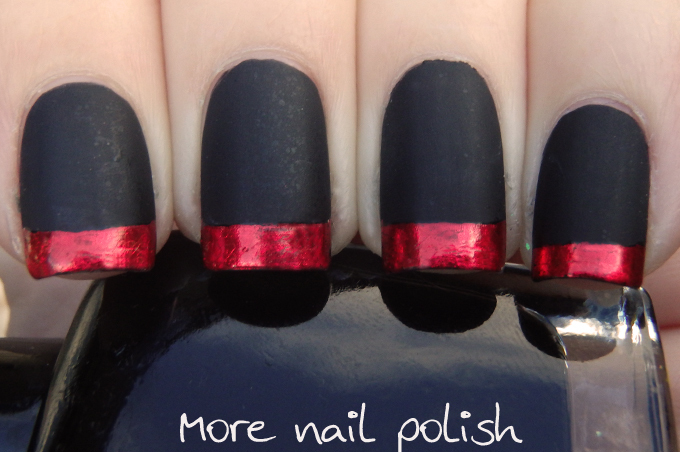 To create this look, I painted my nail with black polish and top coated using quick dry top coat. I then applied a layer of OPI Matte top coat, but any brand matte top coat would be fine. I really wanted the red tips to pop, just like the red band does on the dress, so rather than using red polish, which wouldn't show up very well, I used red nail art foil. I used nail art foil glue to paint a french tip on my nail and then let that dry. Once the glue was completely dry and transparent, I applied the red foil. To finish the mani off and make it last the whole day, I applied Picture Polish Revolution to just the tips. Revolution is a water based glitter base coat that doesn't make the foil wrinkle up for me. I hope you like this look as much as I do, and I hope you don't mind seeing more nail art inspired by some ModCloth dresses. I love it! Kind of looks like Halloween colors. Oh my word! That's STUNNING! I really love it (the mani) and it suits the dress so well! I've been lacking in inspiration recently, so I think I'll have a browse of the dresses too, what a good idea! I would never have thought of that. Wow! Very good idea! I love it!!!! 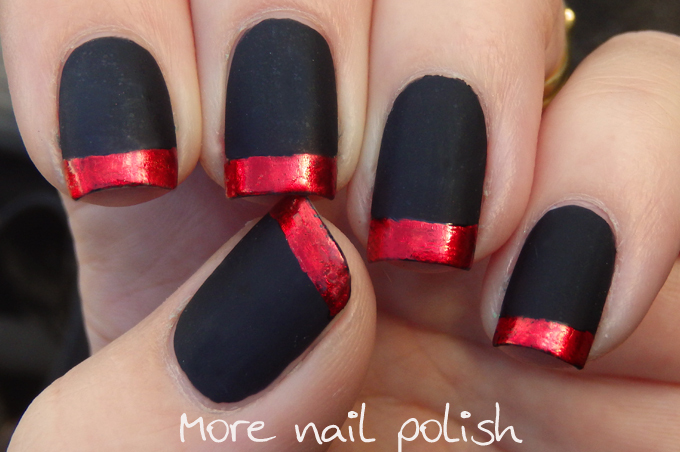 I like both the mani and the inspiration behind it.